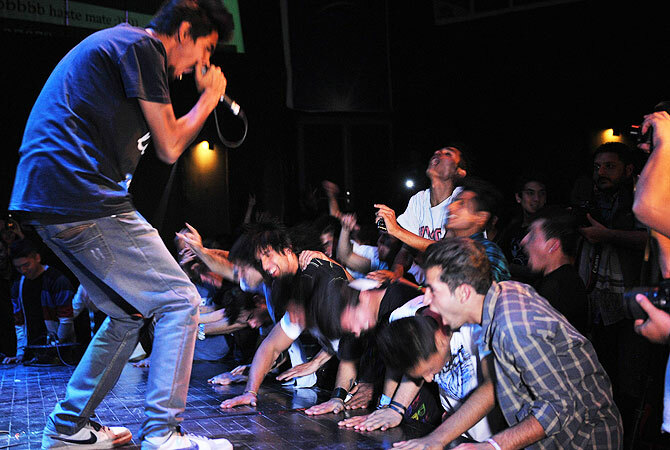 Kabul awakens to rock 'n' roll. The timing of a unique rock festival held in Kabul this week is highly symbolic for the war-torn capital-11 years ago this month the Taliban was routed by a US-led invasion, having banned music and erased women's rights. Out in the provinces gripped by an insurgency and ruled by tradition, such a scene is still unheard of, and would face horrific retaliation. Just five weeks ago, 17 party-goers holding a gathering with music in a southern Afghanistan village were beheaded by Taliban insurgents. 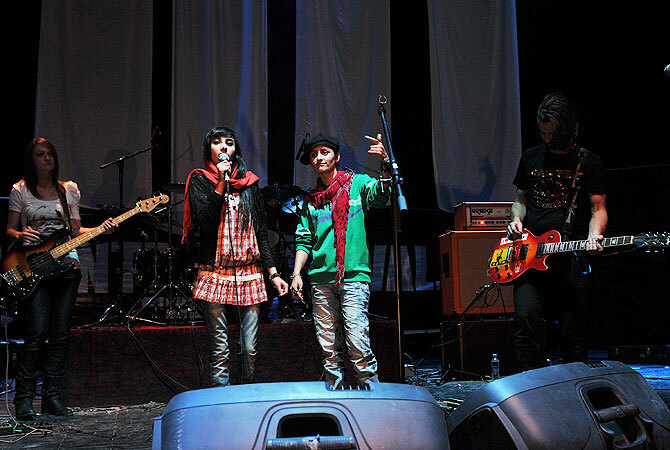 But for three days in the capital, the opportunity to rock out is seized by delighted audiences and performers alike at the Sound Central festival, organised by the French Institute of Afghanistan. “It's so amazing. It's one of the best things I've seen here in 10 years,” Afghan American singer Ariana Delawari told AFP. “On stage, I felt like Buddy Holly or Elvis Presley,” she gushed. “It's like the birth of rock 'n' roll in this country.” Traditional folk music dominates in this conservative nation, although the tinkle of commercial pop can also be heard. Anything else, like pounding drums and bass lines, or wailing guitar solos, represents an alien culture. Qais Shahghcy, a guitarist, was taken aback by the unalloyed joy and enthusiasm of the audience at the festival, which closes Thursday. “I had never seen such a crowd, that craziness. Look everywhere: it's the new Afghanistan. I'm so happy that I think I'm dreaming,” he said. “One of our songs is called “Daydream”. I think it's what I'm living now.” Sweating from his full-blooded performance, Shahghcy added: “I don't know what I played. I played so hard that I killed my fingers”. Outside the building a second stage hosted DJs mixing electro music. People surfacing for air from the dark room contemplated a mural painted by a local modernist artist, and a hip-hop battle saw breakdancers flipping on the floor. “In Afghanistan, we face a lot of problems,” said one performer who gave his name only as Basir, adding that he had been arrested in the past while breakdancing by police who accused him of not being a Muslim. “Today, we performed in a festival. It was our chance. I'm proud of myself,” he said. Australian photojournalist and rock guitarist Travis Beard, founder of the Australian Sound Central music festival and its latest incarnation in Afghanistan, said a music scene taken for granted in the West is relished here. “Afghans are really thirsty for music. The foreigners, who have more access to music, are more nonchalant about it,” he said. He said the festival was an opportunity to show Afghans what is out there, beyond the Bollywood and pop music they are exposed to. “We try to bring an alternative. For us, it's to show that Afghanistan is more than just conflict. That there are new forms of culture.” Some groups from outside Afghanistan were also invited to take part in the festival, including musicians from Pakistan and Sri Lanka. Lead singer and guitarist Mirshad Buckman of the Sri Lankan metalheads “Paranoid Earthling”, drew clear parallels between Afghanistan and the history of his own country, emerging from a devastating internal conflict with Tamil rebels that saw thousands killed. “We had a 30-year war that ended recently. Ten years ago, there were three rock bands. Now, there are more than a hundred,” said Buckman, who was not sure what he would find in Kabul. Who are you to decide? Its an individual choice everyone has to make. The world is more open and connected than ever before. Afghanistan used to be a modern nation before it engulfed itself in an unnecessary scenario. I have deep sympathy and colossal love for Afghanistan and its people. I pray to God that one day there will be peace and prosper in this land and they will get rid off the religious fanaticism. It is wonderful to see Afghanistan trying valiantly to find its true place Do not let down my brothers and sisters. Life is meant to be lived and enjoyed which is why HE gave us this wonderful Earth. Live and let live ! The masters are happy, keep advancing until you forget who you are, then they can trash you like a tissue paper. The youths of Afghanistan have all the right to progress however they should keep in mind their regional values. too much exposure so early may may land them in difficulties. They should concentrate on educations & sports. The foreign forces will not stay there indefinitely. Follow blindly, forget who you are!!! This is the real prosperity..
Entertainment should have limits too. Fight for Rock and Roll. first cricket ... now music ... good on ya , rise up Afghanistan ... it's been long due. Yes. They should never forget their values of the religion of peace and they should look eastwards to their all weather friendly neighbour for inspirations of living as "pure", from the land of the pure. I couldn't beileve my own eyes. It is good for all well done and good luck. What a subtle threat ! !